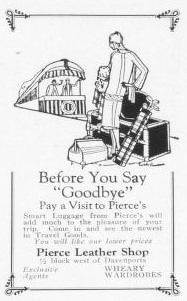 Before you say "goodbye" pay a visit to Pierce's. 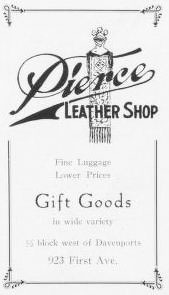 Stuart Luggage from Pierce's will add much to the pleasure of your trip. Come in and see the newest in Travel Goods. You will like our lower prices. 1/2 block west of Davenport. Exclusive Agents, Wheary Wardrobes. Fine luggage lower prices. Gift goods in wide variety.